A few weeks ago (almost a month now), I tweeted about starting the 10 Step Korean Skin Care Routine. 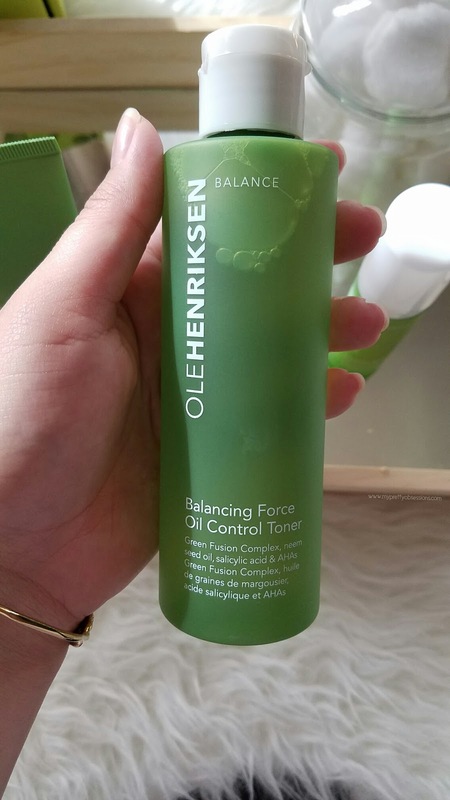 Not too long after, Influenster kindly sent me OLEHENRIKSEN Balance products to try and so I incorporated these new gems into my skincare routine. I plan to write a separate post covering my take on the entire routine so stay tune! 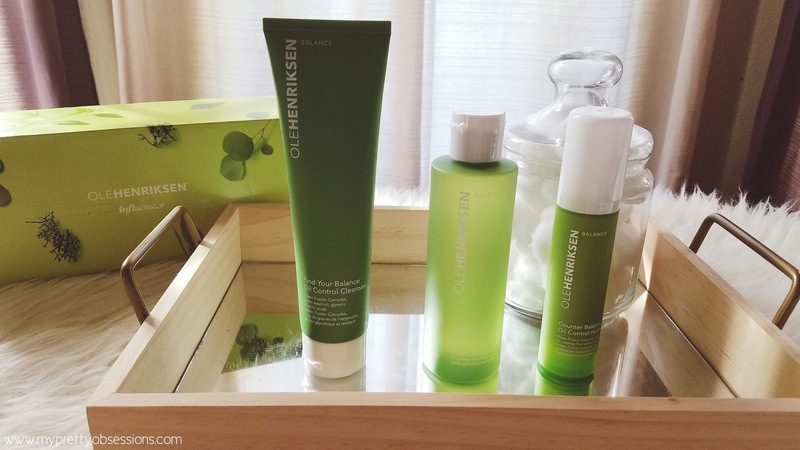 OLEHENRIKSEN did a whole new brand relaunch with an updated minimalist design. Each product line is color-coded and clearly features each product benefits so you can easily identify the right product for your skin concern. All three products we're going to get into below contains a special green fusion complex (a blend of green tea, eucalyptus, algae (kelp), and Irish moss extracts) and neem seed oil (oil pressed from the seed kernals of the need tree which is a tropical, evergreen tree in India). I really love this Oil Control Cleanser! Along with green fusion complex and neem seed oil, this cleanser contains glycolic and lactic acids. It reduces excess oil and cleanses pores - without stripping skin and helps loosen and lift dead skin cells that can build up in pores. The product is sort of a thick gel when you squeeze product from the tube, so you only need a little bit! 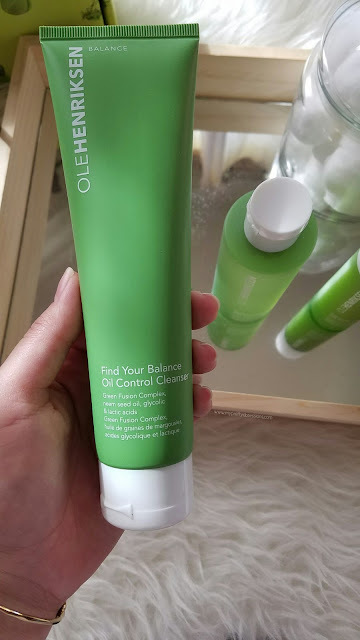 It lathers up really nice while I'm massaging the cleanser onto my face and I can feel my face tingling (both lathering and the tingling reassures me that this cleanser is really working!) which makes me enjoy cleansing my face for a little bit longer than I usually would. After I rinse my face with cool water, my complexion feels so fresh and clean! The Oil Control Cleanser really does cleanse well because when I go to the next step (toning), there's no traces of makeup or dirt on my cotton ball. This toner absorbs excess oil without stripping skin and helps unclog and minimize the appearance of pores. Unlike the Oil Control Cleanser containing glycolic and lactic acids, the Oil Control Toner has salicylic acid and AHAs. I love the extra cleanliness my face feels when using this toner! Unlike other toners I've used in the past - this one does not dry out my face. I'll get a few pimples/bumps here and there and this toner helps soothe them and they would be gone the next day. FYI, the Balance Collection features an invigorating eucalyptus-peppermint scent which I love but for those who are sensitive to smell may not care for it. I find the minty scent stronger in the cleanser and toner but subtle in the moisturizer which we will get into below. The Oil Control Hydrator claims that it improves foundation wear for up to 8 hours. I've used this hydrator underneath my makeup and have no issues with makeup slipping or wearing off easily. Containing rosehip fruit extract and AHAs, this Oil Control Hydrator is perfect for oily prone skin. It is hands down, my new favorite moisturizer! This gem is ultra-light, controls oil, and mattifies. Let me repeat the last part, MATTIFIES - y'all... I have not used a moisturizer that mattifies before. I never thought that a moisturizer could achieve a matte finish until I started using this (Dear Ole, you've changed my world!). 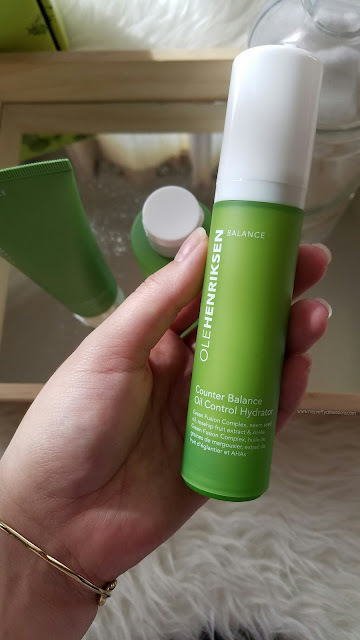 In my skin care routine, I use the OLEHENRIKSEN Balance Collection in the evening because these products contain glycolic acid, lactic acid, salicylic acid, and AHA's (alpha hydroxy acids). It's suggested that when using products containing acid ingredients, it's best to avoid sunlight because skin irritation can possibly occur and so I think it's best to let the products work its magic while you're sleeping. The Balance Collection can be use day and/or night but if your skin is sensitive like mine, I recommend using it at night. *Samples were sent to me courtesy of Influenster for review purposes. Any opinions are my own.